This Augmented Reality App Lets Ladies Try on Swimsuits in a Virtual Dressing Room, à la Kinect & Minority Report Style ! 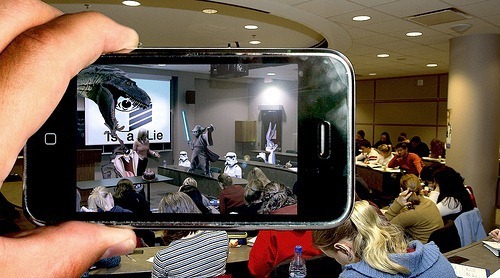 According to Wikipedia, Augmented Reality is a term used for live direct or indirect view of a real-world physical environment whose elements are augmented (read: enhanced / given more information about graphically) using computer-generated imagery. It’s basically what you see when you look through the viewfinder on Iron Man or Samus Aran’s helmet. Apps like Layar, Google Sky Map (Android) and Wikitude World Browser (iPhone) already make use of this technology. With Try On Bathing Suit by immediaC, you can try out new clothes in a virtual dressing room. The app works from a webcam that acts as both the mirror and input device. Once you select the dress (only bikinis available at the moment), you can use Kinect-like gestures and motions to change the size, width and height. It works like something taken straight out of Star Wars or <insert name of futuristic epic space film here>. SlashGear notes that this kind of technology would definitely work well for people who tend to shop for clothes online. You can see the software in action below.